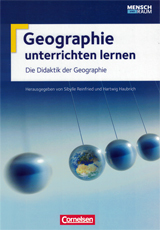 The state-of-the-art textbook «Geographie unterrichten lernen» provides a comprehensive and current introduction into the fundamentals of geography education. It is an essential resource for the entire community in geography education, including university faculty, students, practitioners in the schools, and geography education professionals outside of universities. given by Pankraz Freitag, member of the Swiss Council of State, to Prof. Dr. Sibylle Reinfried (PHZ Lucerne) and Dr. Simon Scherrer and Dr. Peter Kienzler (Scherrer AG) by the “Netzwerk Wasser im Berggebiet” [“Mountain Water Network”] for the educational project „Freshwater sources and alpine hydrology in school education“. The book addresses the issue of students’ alternative conceptions and knowledge in geography and geoscience education. It includes the results of recent conceptual change research in Switzerland and Germany and displays the current state of the discussion. Children dispose of alternative conceptions about the world and the natural environment that differ greatly from a scientist’s view of these issues. One concerns the idea that global warming is caused by a hole in the atmosphere, i.e. the ozone hole. Teachers who want their teaching to be more effective need to know their students’ conceptions prior to instruction. The article describes lay people’s alternative conceptions concerning geosciences concepts (groundwater, glaciers) and explains why it is so difficult but necessary to change people’s understanding of these concepts.